In this edition of Podcast Stats Soundbites we take a look at intelligent assistants and smart speakers. Smart speakers–speakers that contain or work with Google Home, Alexa, and Apple HomeKit to control smart home features, start vehicles, and play music & podcasts–growth surged in 2018. It’s the latest in the tech giants land grab for an ever increasing slice of our lives. But what impact, if any, will the growth of these gadgets have on the podcasting space? In 2018, smart speaker growth was fast. Really fast. Like, “they’ve gone to plaid” fast. According to Blubrry’s proprietary, IAB Tech Lab Certified, podcast statistics, year over year growth from February 2018 through February 2019, market share of podcast downloads via smart speaker grew at a rate of more than 2,500%. No. We didn’t miss a decimal. 2,500% growth, year over year. But–and there’s always a but–smart speaker use for podcast listening is still relatively small compared to other channels. Podcast downloads via smart speaker accounted for only 1.8% of total downloads. Small, yes, but it’s now larger than podcast downloads via tablets. And if we extrapolate to February 2020, with straight line growth based on the 2018 pattern, podcast downloads via smart speaker could be closing in on 3% market share. What Might This Mean for Podcasters? For starters, you probably shouldn’t freak out and change all the things. But, it’s probably a good idea to make sure you are positioned well for discovery via voice search. Just like traditional text-based search, it’s important to be at the top of search results for queries related to your podcast. But, given the user experience for smart speakers, that top search result becomes even more important. One easy thing to do: make sure that your audience knows to ask their smart speaker for your show. Podcast stats aren’t just for nerds anymore– at least, not if you want to learn about market trends and grow your podcast. As part of our regular series on podcast stats, this week’s Podcast Stats Soundbite is as American as Apple Podcasts. Yeah. We’re going to make another Apple Podcasts prediction. Podcast Stats Soundbite 1: Apple Podcast’s market dominance is a marriage of convenience. As previously discussed, Apple Podcasts is still, far and away, king. Now, maybe this one is obvious, but to remain at the top of the hill, you have to outcompete all comers. But a challenger only has to be right once to topple the big kahuna. Especially if you’re the market leader because of convenience. Think about your own experience: podcast discovery is less than intuitive, to get your podcast on Apple Podcasts you don’t actually upload it there (which is super confusing to podcasting newcomers), and on and on. Ok. We’ll be more blunt: Apple Podcasts is the Internet Explorer of podcasting. Podcast Stats Soundbite 2: Apple Podcasts will drop below 50% market share in 2019. Yep. You read that right. Based on our proprietary, IAB Tech Lab Certified, podcast stats data, we see an industry shift underway. We have Apple device data back to 2007, and Android data going back nearly a decade. And the trends are plain as day. So plain, in fact, let’s take another step out on this branch and make an even bolder prediction: Apple Podcasts will drop to ~35% market share in 2019. There are simply too many other options out there. Especially with Spotify attempting to muscle its way into the podcasting space. Which, honestly, we think is a good thing. More competition forces all of us to stay on our toes, and keep our platforms top notch. A few weeks ago we examined podcast stats related to religious podcasts. So, in the interest of continuing to talk about the taboo, in this week’s edition of Podcast Stats Soundbites we thought we’d take a look at political podcasts. Because here we are again–in the US, at least. A few months removed from the 2018 midterm elections, and just under two years from the 2020 presidential election. Which means, of course, that the party not in the White House is off to the (primary) races. Which got us thinking: how does the podcasting space react to elections in the US? But first, the obligatory disclaimer: we are here to look at podcast stats data, not to endorse a particular political point of view. Well. It’s like you might expect: a presidential election year generates an increase in the number of Political podcasts. But, in the 9 months immediately following a presidential election–going back to 2008–there are new podcasts added in all categories across the board. And Religion reigns supreme. By far. News & Politics podcasts did see a (relative) 25% jump (from 4.35% to 5.4%) in the number of new podcasts in the 9 months following the 2016 presidential election. But that only took them to 5.4% of total new podcasts created. So, for all the attention the news media gives presidential elections, and for all the chatter on social networks, it appears that people would rather share their perspectives and stories in podcasts about religion, culture & travel, comedy, and business. In a followup post, we will examine the number of listeners these new podcasts generate. Here’s a hint, though, from a previous Podcast Stats Soundbite: Religious podcasts dominate both new podcast creation and downloads per episode. BRICS “is the acronym coined for an association of five major emerging national economies: Brazil, Russia, India, China and South Africa.” They account for about 40% of the world’s population, 23% of the gross world product, and are forecasted to grow at a faster rate than the rest of the world. Kind of a big deal. And, when we took a deep dive into our proprietary podcast media download statistics–which go back a decade, we found pretty interesting factoids. In this edition of Podcast Stats Soundbites, we take a look at the Brazilian podcast market. Spoiler alert: it’s large and growing quickly. Might want to pay attention. In 2009, podcast downloads in Brazil didn’t even make the top 10. Floating somewhere between 13 and 20, Brazil wasn’t really on any podcast market radar. All that changed by 2012. Brazil podcast downloads grew by ludicrous triple digits year over year in 2010 and 2011. And, when they slowed down to only 70%+ in 2012, they had some serious momentum. Brazil’s average Q4 year over year growth rate for podcast media downloads is an astonishing 127% for the past decade. Brazil is now the second largest podcast download market in the world– bigger than the UK and Australia… combined. The US is still, far and away, the largest podcast market with 660M+ downloads in 2018. But Brazil saw 110M+ downloads in 2018. Brazil is huge. And growing. Based on our podcast stats, while Brazil saw podcast downloads grow by 33% in 2018, the other top five (USA, Canada, UK, and Australia) saw decreases of 3% – 12%. The Brazil podcast market is huge and growing. Do you have a Portuguese language version of your show? Do you listen to any? Or, do you have any burning podcast stats questions you’d like us to answer? We have a wealth of data going back a decade. 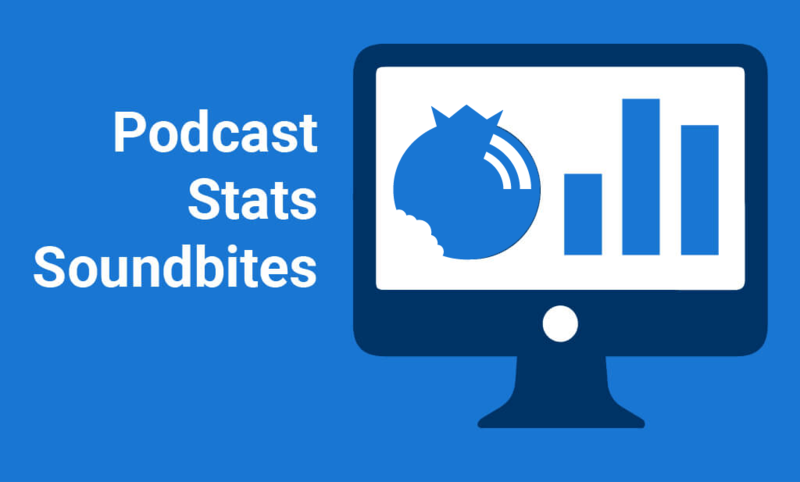 As part of our continuing series Podcast Stats Soundbites, this week we’re going to take a look at a treasure trove of podcast media download statistics. Specifically, podcast download clients–Apple Podcasts, Spotify, Stitcher, etc.–some trends we see, and what that might mean for the podcasting space overall. Based on proprietary Blubrry Pro Podcast Stats data, Apple Podcasts, formerly known as iTunes Podcasts, is still the most used podcast download platform. In 2018 it was nearly 3x as large as the next nearest ecosystem (Google’s various devices and apps), and nearly twice as large as Google, Stitcher, Microsoft, Spotify, and Amazon combined. From January 2018 through December 2018, Apple Podcasts consumption moved from iOS to WatchOS in a big way. From January through August, Blubrry Pro Podcast Stats data show that Apple Podcasts on iOS grew from ~45% market share to ~50% market share. From September through December, Apple podcasts decreased to ~27% market share. That’s almost half. Where’d that market share go? Primarily Apple Watch, which grew from nothing to nearly 9% market share in that same period. What about the rest of that market share– where’d it go? Death by a thousand cuts. Everything from Stitcher (minor growth from 2.5% to 2.7%), to Spotify (grew from 0% to 1%), to CastBox.fm (which appears to be inversely correlated to Apple Podcasts: when Apple gains, CastBox.fm loses, and vice versa). As a market matures, it is common to see fragmentation as new entrants divide up existing market share. However, seeing such a precipitous drop by Apple Podcasts is not common. Based on the podcast stats data outlined above, we predict that Apple will create an Apple Podcasts Alexa skill as a way to hedge their podcast download market leader position. Amazon reportedly has 100 million Alexa enabled devices in the market. Among the primary use cases for these devices is listening to music and podcasts. So, just as Apple added Apple Music to the growing list of Alexa skills is 2018, it makes good sense, strategically, to have Apple Podcasts represented in this growing market. As an aside, while Google has more Google Assistant devices in the market, Google’s phones and Android also compete directly with Apple’s golden goose: iPhone. Apple Podcasts is still huge, but it’s losing market share to… Apple Watch and a bunch of (relatively) new entrants. So we’re predicting that Apple’s going to produce an Alexa skill for Apple Podcasts. Bold or blah? What do you think, and why? Maybe podcasting is a modern continuation of the prophets, town criers, and sages of old (which is pretty dang cool, if you think about it). Maybe podcasting is yet another channel where we create self-selecting “filter bubbles” lacking any diversity in life experience or perspective (but there are things you can do to fix that.) 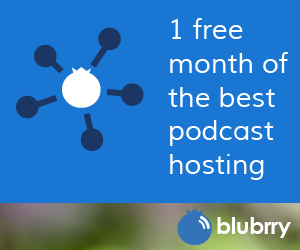 Whatever category, whatever reason over the past decade or so Blubrry has had the great fortune to be home to hundreds of thousands of podcasters in our Podcast Directory and our Podcast Stats & Podcast Hosting platforms. This year, we’re going to be focusing a bit on Podcast Statistics, making some predictions, and calling out what we believe are interesting factoids. We hope you’ll come along on this journey with us find some interesting, useful factoids. Let’s get this out of the way first: we are not here to promote one religion (or no religion) over another. This is simply looking at the production and consumption of religious-themed podcasts. Of the 660,000+ podcasts in the Blubrry Podcast Directory, there are just over 92,000 podcasts in the Religious category. That’s almost half again as many podcasts in the Religious category than the next largest category, Culture & Travel which has nearly 65,000. Religious podcasts account for nearly 15% of total podcasts. Over the past decade, Religious podcast listeners (as measured by downloads) has increased by 85%. On average. Per year. 85%. That’s a phenomenal growth rate. Interesting side note: most of that enormous growth rate happened in 2015, when we saw a jump from roughly 110M downloads in Q4 2014 to nearly 680M estimated downloads in Q4 2015. If we remove that anomalous year, the growth rate still averages nearly 30% per year, which is nearly triple the average growth rate of all podcast estimated downloads. Ok. We’ve established Religious podcast have seen huge growth in both creation and listenership. But what about how many listeners each podcast can expect to attract? Well, Religious podcasts fall slightly below average on this measure. Religious podcasts attracted, on average, 8.75% fewer downloads per podcast (4,166 for religious podcasts vs. 4,565 for all categories) in Q4 over the past decade. This makes sense when you consider the massive number of religious podcasts that are created: it’s fragmenting the listener base. Not only are Religious podcasts the largest category–by far–but they’re also growing more quickly than average, both in terms of podcasts created and listeners (as measured by downloads). But they are slightly below the average number of listeners per podcast. Be sure to check back next week when we’ll be discussing Apple vs. Amazon and making a fairly bold prediction for 2019.